Note: Instead of Dry Coconut Powder and Coconut Milk Powder you can use 1 1/2tbsp Desiccated Coconut. Wash & slice Karela/Bitter Gourd into 2-3 inches (long slices), keep aside. Mix all the “For Pressure Cook” ingredients in a small Vessel with bitter gourd mix well so that all the bitter gourd gets coated with thick paste, close the Vessel. Place the closed vessel in the cooker & Pressure cook for 6 whistles with medium flame. Once it’s cooled. separate bitter gourd from the liquid. In a separate bowl with lid, mix the “For First Coat” ingredients. Close the lid & shake well so the powder mix gets coated to the wet bitter gourd. Mix the “For Second Coat” ingredients & spread it in a plate. Roll bitter gourd in it. Remove it to paper towel. 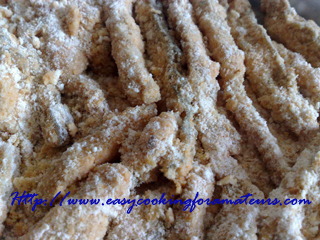 Karela Fingers is ready to serve. It's fried so it has to be tasty! It looks wonderful! 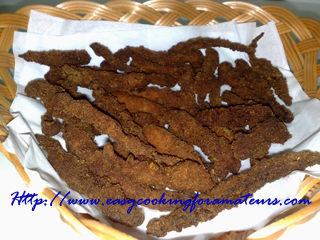 Wow bitter gourd fingers looks super crispy and fabulous..
Dear Madhura,Karela fingers look very crispy and yummy. I have some awards to share with you please accept them from my blog. Wow what an intricate but wonderful recipe for this dish.Sounds amazing.My 1st visit here.Following your blog. That looks delicious. I have never seen bitter gourd before... What is jaggery? Jaggery means Unrefined sugar made from palm sap. That's a very interesting recipe. Would love to try them. Interesting name...Spicy is my favorite. This recipe is a lit bit like my BBQ beef.